Distribution: They tend to be common in the intertidal zones around the world. 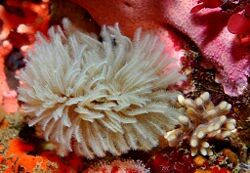 Description: Feather duster worms are sedentary marine polychaetes where the head is mostly concealed by feathery branchiae. Encased in a translucent tan tube made of protein and filtered particles and sometimes covered in sand and bits of shell, it boasts a plume, colored orange to maroon or brown which is sometimes banded with lighter pigmentation. 30 feather-like reddish gills (called radioles) are on each side of the tube. The gills serve a double purpose. They are also covered in eyespots, so the worm knows when danger is near and can retreat into its tube. 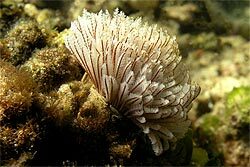 Ecology: The feather duster worm are filter feeders which feed on small food particles and plankton floating in the water and can only thrive in areas with moving currents that bring in new plankton, but it does not simply wait passively for them. Instead, it creates a current in the water to direct the particles into its mouth. By waving its "feathers," the animal creates a gentle water flow, which in turn creates vortices on the upper surface of the tentacles. The surface of the tentacles is bathed in sticky mucus that traps any particles unlucky enough to hit it, like a spider's web. Interesting facts: Feather duster worm's fertilize externally and depending on the species they will either brood eggs or spawn freely. (In the latter case, the eggs are deposited in gelatinous masses either on the parent's tube or on the seafloor.) Once the eggs are released, they float freely for three to four weeks before settling down. Status: Rocky shores in particular are under siege from human trampling, over collecting and in some areas large sanding up events which reduces the rock pool habitat of the feather duster worm. They are not on the vulnerable or threatened species list.